by Larry King, Midwest Regional Sales Manager, IFH Group, Inc.
Beaver Valley Power Station (BVPS) is a nuclear power plant near Shippingport, Penn., 34 miles from Pittsburgh. The plant has two Westinghouse pressurized water reactors capable of producing 970 and 920 megawatts of power, respectively. It is owned by First Energy Nuclear Operating Corporation. Unit 1 has been in commercial operation since 1976, and Unit 2 commenced commercial operation in August 1987. The plant’s location on the Ohio River has the historic significance of being on the site of the United State’s first nuclear power plant, which went into service on December 2, 1957. It generated 60 megawatts of electricity at full power, according to Tyrone Turner, supervisor of the tool room and metrology lab at BVPS. In a modern, large-scale facility such as BVPS, there is large amount of machinery such as turbines, diesel generators and a vast array of pumps, all of which require lubrication. “Every pump and gear case in the plant requires its own lubricant,” said tool room attendant Ted Kubera. Now in his 30th year with BVPS, Kubera is in charge of the daily operation of the oil room, located within the tool room area at the plant. Because security is a priority, access to this secure room is restricted. “The tool room is always locked when unoccupied,” Kubera said. And because the oil room is located within the heated tool room, the oil is not only secure, but is also warm and ready to use. Making sure that every piece of machinery in the plant receives the right lubricant is critical, and it’s important that the oil is fresh, clean and free of contaminants. 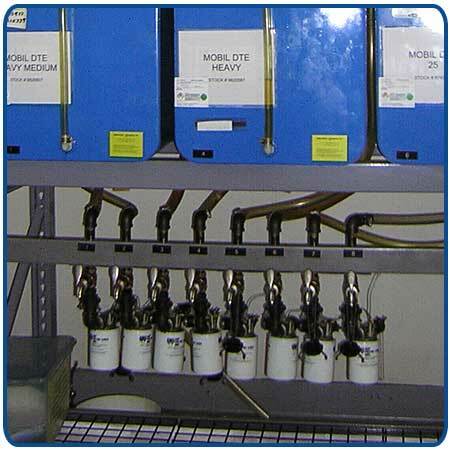 A variety of premium-performance circulating lubricant oils of different grades and weights are stored in a custom-designed fluid storage and dispensing system manufactured by the Innovative Fluid Handling (IFH) Group of Rock Falls, Ill. The system was sold to BVPS by M.W. Byers Co., Carnegie, PA, who helped BVPS custom-design the system and install it in 2001. “We listened carefully to what BVPS’ special needs were, and worked with The IFH Group to make sure they got an oil storage and dispensing system exactly to their specifications,” said owner Warren Byers. Now, the 55-gallon drums are delivered into the oil room and the oil is pumped into the containers in the storage and dispensing system, which is arranged in two rows, one on top of the other, of 12 containers each (Figure 1A). Each of the 24 lightweight 65-gallon capacity aluminized steel containers holds a different oil, and is clearly labeled with the name and grade of the product (Figure 1B). 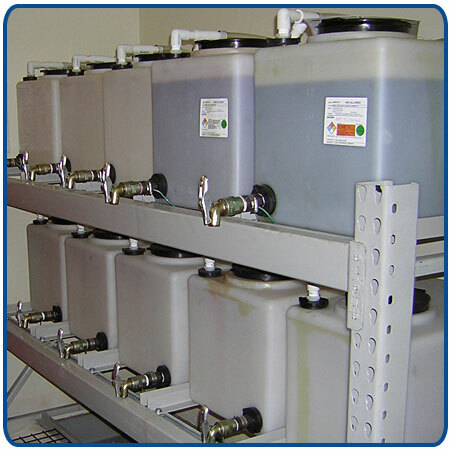 The 10 gallons of additional capacity that each container holds enables all of the product to be pumped out of the 55-gallon drums and into the system. Each container also has a sight gauge that clearly shows the level of lubricant in it. This feature makes inventory control easier and eliminates the need to have extra product standing by. A key reason for the installation of the system was to prevent cross-contamination. A product is filtered as it is pumped into the numbered containers by the quick-coupling filter assembly through a corresponding numbered valve arrangement underneath the containers (Figure 2). This helps to ensure that the lubricant the technician is getting is exactly what has been requested. Drip pans contain all spills. In place of the standard screened vents, each row of tanks has the vent fittings piped to a Des-Case desiccant breather installed on the side of the container system, one per row. This way, whatever contaminants that may be in the ambient air (especially moisture) are not drawn into the containers when the oil is discharged. This ensures that the air entering the containers is always clean. “Cross-contamination from one type of oil to another is one of the biggest problems,” Kubera said. “We ensure that no two different oils from different families ever touch each other.” With this system in place, the oil is filtered at three microns. The plant prides itself on the detailed procedures it has in place to make sure the wrong lubricant is never dispensed. 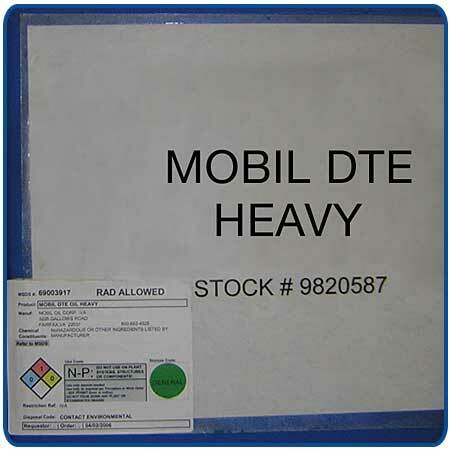 Prior to leaving the issue point, a Material Safety Data Sheet (MSDS) label containing the product name, grade (heavy, medium, light, etc. ), the manufacturer, chemical makeup, and combustibility rating is printed. 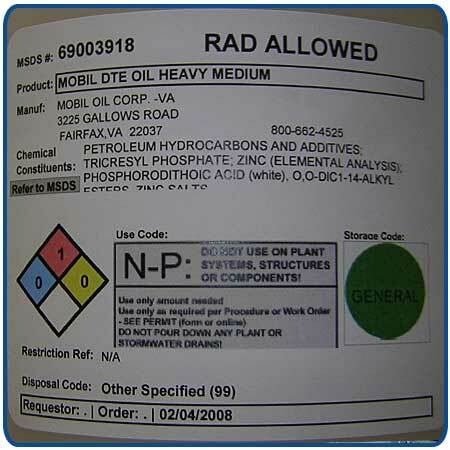 In addition, the MSDS information addresses any restrictions (Figure 3). 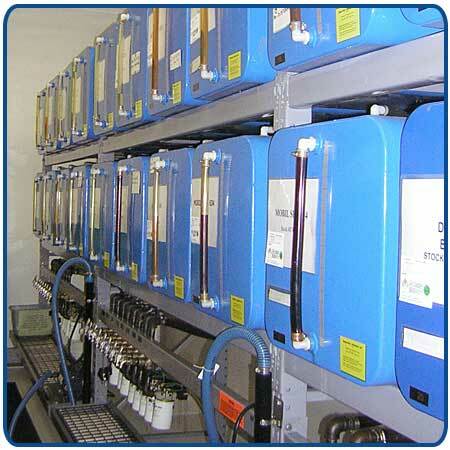 The 24-container system is used for every-day oils, Kubera said. For less frequently used lubricants, the plant installed a 10-container system in 2006 that employs 15-gallon capacity containers made of polyethylene (Figure 4). For seldom-used oils not stored in the IFH containers, Kubera devised a security tag that is placed on the 55-gallon drums in which they are stored. No one can help themselves to the contents of any of these drums without breaking the seal; therefore, this process ensures positive control. Waste oil is stored in flammable waste cabinets located within the tool room outside the oil room. Each waste container contains two 55-gallon barrels. All oily waste by-products are disposed in specially marked bags and then removed from the tool room. Beaver Valley’s process for the storage and dispensing of lubricants has made it a model plant that First Energy plans to initiate in its other plants.